First of all, however, let me tell what Only In Edinburgh isn’t. If you are looking for recommendations for hotels, general dining guides, or a nice itinerary of sights to see, all arranged in order… well, that’s not your guide, go consult, say, TripAdvisor. But if what you are looking for are the things that most likely aren’t in the other travel guides and web resources, this is definitely the book for you. It’s basically a list of 103 different attractions, ranging from the fairly obvious, like Edinburgh Castle (#1 on the list), to some fairly unique ones, like the UK’s largest poppie factory (#81), churning out millions of red paper poppies worn annually in recognition of the veterans of WWI and later wars. But even for the fairly mainstream attractions, like Edinburgh Castle, the book is replete with all sorts of little details that are easy to miss, especially if you don’t have an eye for detail or have spent some time researching, like details of how the gatehouse, while looking old, is a combination of relatively new 1888 construction combined with a 70s era tunnel to allow military lorries to enter. Or a nice callout to the cemetery for Soldiers’ Dogs, or the presence of a “Laird’s Lug”, a window for eavesdropping upon conversations in the Great Hall. This level of detail continues for some of the other attractions, such as the Museum of the Mound’s display of a million Scottish Banknotes (#8). Or the easy-to-miss marker in the pavement noting the location of Scotland’s last public execution (#10), or even explorations of the various nooks and crannies of the Old City itself, such as the remnants of the old town wall (#39) or the “Innocent Railway Tunnel” that now serves as a pedestrian way (#46). And while it’s not generally aimed at lodging and dining, it does occasionally mention some of the more interesting options, like a tour of restaurants located around the Old City, like the Contini Cannonball, which features Edinburgh’s oldest door knocker (#14). Overall, I found it to be a particularly useful, and detailed guide, giving me substantially more detail that I would have learned from other books or walking about. It will certainly be in my bag the next time I visit Edinburgh. Want to know more? Consider purchasing his guide, or one of the related guides to other cities (Hamburg, Cologne, Paris…). They are quite the treat. 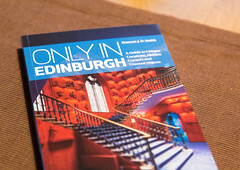 (Disclaimer: I did receive a review copy of Only in Edinburgh and a complimentary copy of Only in Paris from the author in thanks for providing photography to him. I still find the books indispensable). One of the things I learned long ago about living in New England is that certain phrases should immediately make your “Danger, Danger, Will Robinson!” alarm go off. One of those is most any sentence containing both “New England” and “Barbecue”. Also up there is “New England” and “Mexican”. Really dangerous is the combination of “New England” and “Authentic Mexican” food, since, while I’ve been to the occasional good actual Mexican place (including El Rincon down in Manchester, or when they have their A game going, Gusanoz, although for the latter I usually need to budget extra for the extra margarita I’ll need to wash down the bad service), usually I find an “Authentic” place to be dismal Tex-Mex at best, sub-Old El Paso at worse. But every once in a while I do stumble across a place that’s actually putting in a good effort, and not just dishing out queso-flavored disappointment. So, on that note, I introduce you to El Rodeo.